Cracker Barrel bolsters their coffee selection with the arrival of the new Goo Goo Cluster Latte, a drink inspired by the Goo Goo Cluster candy bar. Available for a limited time, the new latte consists of espresso and steamed milk mixed with caramel, milk chocolate, peanut, and nougat flavors, and then topped with whipped cream, a caramel drizzle, and chopped Goo Goo Cluster pieces. 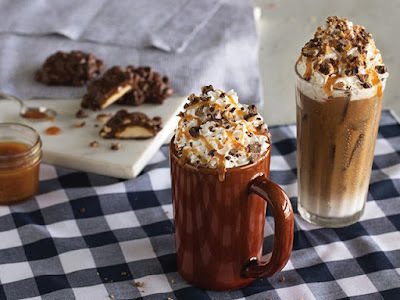 The Goo Goo Cluster Latte joins Cracker Barrel's Crafted Coffee menu which also includes Mochas, Lattes, Vanilla Lattes, and Caramel Lattes. Each coffee drink on the menu is available hot or cold with prices starting at $3.29. A Good Goo Cluster is a disc-shaped candy bar with layers of marshmallow nougat, caramel, and roasted peanuts covered in milk chocolate.